Slip on the JBL Everest™ 310GA and you’ll experience up to 20 hours of wireless freedom, the thrill of mind blowing, Legendary JBL Pro Audio sound and the ergonomic comfort offered by premium material finishes and a snug fit. Now optimized for the Google Assistant, you can take full control of your music experience using your voice and receive notifications without glancing at your phone. Simply get help from your Google Assistant using the touch sensors on the earcup. ShareMe 2.0 technology allows you to connect and share your music with friends, via Bluetooth. A quick 2-hour recharge, a sleek flat-fold design and a compact hard carrying case make these headphones the perfect companion for your busy lifestyle. A built-in microphone facilitates crystal clear hands-free calls. Dare to listen. EVEREST™ 310GA is rated 4.6 out of 5 by 13. Rated 5 out of 5 by justjen35 from great product I am still learning these but I am pleased thus far. The 'users manual' is in such tiny print I really am unable to read it which was a disappointment but I am hoping to look online for some references. I use these to work out and the feature to touch the google assistant sign on the side of the headphone for your alert s will go off while i am exercising so I am hoping i might be able to deactivate this. But overall these are a good headphone with great sound quality and very durable. I would recommend. Rated 5 out of 5 by L A Rush Audio from Exceptional product and customer support from jbl! I ordered these headphones in purple during an online sale that was almost 65% off. The 40mm drivers pack a punch, the optional cord allows me to use them in studio or on the go, excellent battery life with a super quick charge time, and last but not least the sick color choices are exactly what I was looking for. Jbl has a customer for life! First time I’ve ever found the best price on a products home website. Keep up the great work guys! Which is the difference between Everest 310GA and Everest 310? The main difference between the Everest 310 and the Everest 310GA si the GA part which means Google Assistant. The Everest 310GA can be set up with your phone's Google Assistant so you can give it commands and talk to it. Do the headphones come with a cable so you can use the headphones without Bluetooth: a cable that goes from your phone to the headphones? are these compatible with lg oled tvs?? 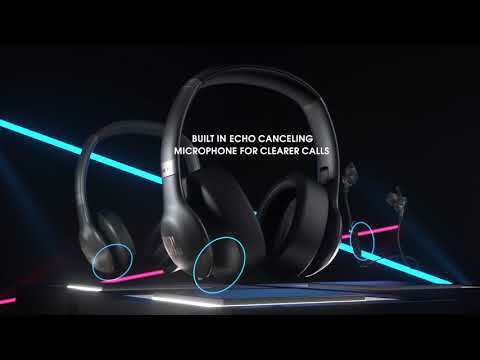 Most of our bluetooth headphones are designed more on Music and not video, please do expect latency when playing videos/watching tv/gaming when connected through bluetooth. I would suggest using a wired connection when connecting to avoid the said issues. Our JBL EVEREST 310GA (Google Assistant) only works with the Google Home App. It was designed so that you can just use the touch sensors on the earcup to fully control your music or receive notifications without glancing at your phone. Is the 310GA compatible with the JBL headphones app? Because my 310GA aren't being detected, the app just asks me to connect headphones. Also can you specify which headphones are actually compatible with the JBL headphones app? You might find the answer to your question in our Product Support FAQ and knowledge base sections: https://www.harmanaudio.com/support-knowledgebase.html. To submit a support case, please fill out he Contact Us form at the same location. Is there a setting to adjust the bass or treble? There maybe third party apps available for download with equalization features. I have the JBL 300, they are blue, had them for a few years, the ear pads are falling apart, the material is coming off, they work just fine, is there replacement ear pads? Hi! Yes we offer replacement earpads.&nbsp;We would like to work with you directly to help you with your issue. Please submit a case request at https://www.jbl.com/support-contact.html and the Customer Service Team will be more than happy to assist you.